As part of investigations into the impact of long-duration space travel on squishy biological creatures, researchers at Johns Hopkins University blasted rats with high-speed particles. 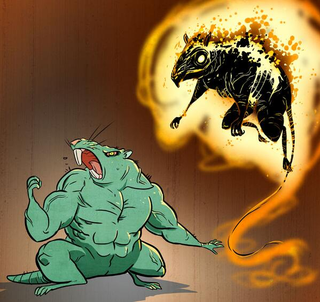 Shockingly, the irradiated rats failed to develop awesome superpowers, instead developing cognitive issues. Whoops. Down here on Earth, our magnetic field protects us from high speed particles. It not just protects us, it does the job beautifully: charged particles interacting with the magnetic field produce gorgeous auroras! If you have access to a cloud chamber, you can watch cosmic rays interacting with the vapour. They're common enough that one passes through an area the size of your hand about once a second, but that's far fewer (and generally lower-energy) than what is experienced outside the protection of our planet's magnetosphere. Any astronaut who leaves the protection of the Earth, like during the multi-year trip to Mars, will be exposed to a whole lot of these high-energy particles. The experiment looked at head-exposure only, so long-duration astronauts on prolonged space missions better think about some seriously high-grade radiation shielding. Read the full comic and the rest of the story at Boxplot on Popular Science. Read the original peer-reviewed publication on BioOne. Image credit: Maki Naro excerpted from Cosmic Daze. I swear I'm not obsessed with radioactivity despite my recent fascination with the Chernobyl Exclusion Zone.